When working with heavy and abrasive tools and objects, ensuring handwear is protective enough to prevent against injury is essential. The Ansell Hycron 27-810 Fully Coated Heavy-Duty Long Work Gloves have been designed to protect hands during tasks where tools and materials can put hands at risk of harm. The gloves are comfortable to wear, are exceptionally durable for ongoing protection and wear, and include a longer safety cuff for improved protection. The product code for the pair of gloves is: 27-810. With an EN 388 Level 4 abrasion resistance, the Hycron 27-810 gloves are ideal for handling rough materials and working with tools. 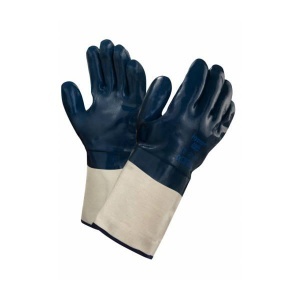 They protect hands while allowing them to remain comfortable at work. They are strong and durable to ensure that hands can be protected more thoroughly and for longer, all without compromise to performance. The table below showcases the test results of the Ansell Hycron 27-810 gloves according to EN 388 Mechanical Risk specifications.